Wasps secured their playoff spot for the 2018-19 Premier 15s season in style with a 47-20 win against Gloucester-Hartpury. The visitors pulled away late in the second half finishing off with six tries, three coming in the final 20 minutes. The fantastic advert for the game was played in front of a passionate crowd at Kingsholm. Gloucester-Hartpury started the game the stronger of the sides, picking up the opening score inside five minutes. Wasps responded through two penalties from the boot of Lizzie Goulden, who scored 17 points on the day. The visitors had to spend large parts of the first half defending against the cherry & white side who looked to stretch the hosts out wide. Gloucester-Hartpury got their second score on the half hour mark to lead 10-6. 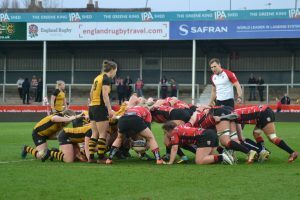 Wasps proved clinical as they scored with two ventures into the Gloucester 22 in quick succession just before the break. The first coming through captain Kate Alder, before Hannah West dotted the ball down against the base of the post on the stroke of half time. Wasps led 20-10 at the break. In a thrilling second half the two sides exchanged scores early on. After Millie Wood crossed for the home side, Alice Sheffield extended the Wasps lead just before the hour mark. The hosts hit back almost immediately with their fourth try, looking like a nervy finish was in order. But, entering into the final 20 minutes, Wasps’ pushed ahead to seal the important victory. Two of the three tries were set up from interceptions by Gemma Rowland as Gloucester-Hartpury looked to attack from deep. The first came as the ball was spread wide to Abby Dow on the wing, before Cliodhna Moloney crossed from close range for Wasps’ fifth. The final score was a fantastic connection from the backline who had looked dangerous for the entire game with ball in hand, finished off by Claudia Macdonald, one of the internationals returning to the side. Wasps will be delighted to have put together such an outstanding performance after a long international break. The visitors showed great composure when Gloucester-Hartpury continued to narrow the gap, and put some brilliant scores together in the process. 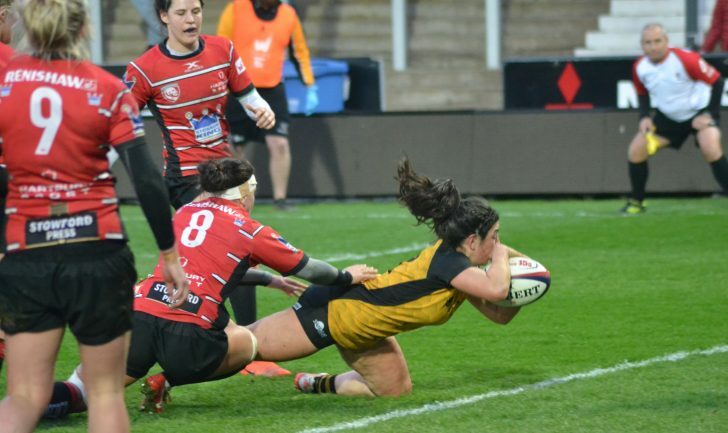 The win means Wasps are safe in fourth spot with one game remaining in the Premier 15s season, they will face Saracens, who also secured top spot this weekend, in the semi-finals. Wasps final game of the regular season sees them host Bristol Bears in the Big Swarm at Twyford Avenue on March 30th. Get your tickets here.